Here are some new paintings which were produced for the Illuminate exhibition. The first new painting is simply called Tulips. It celebrates the colour yellow and the way light plays with and enhances this colour in nature. I wanted these flowers to be both monumental but also intimate. 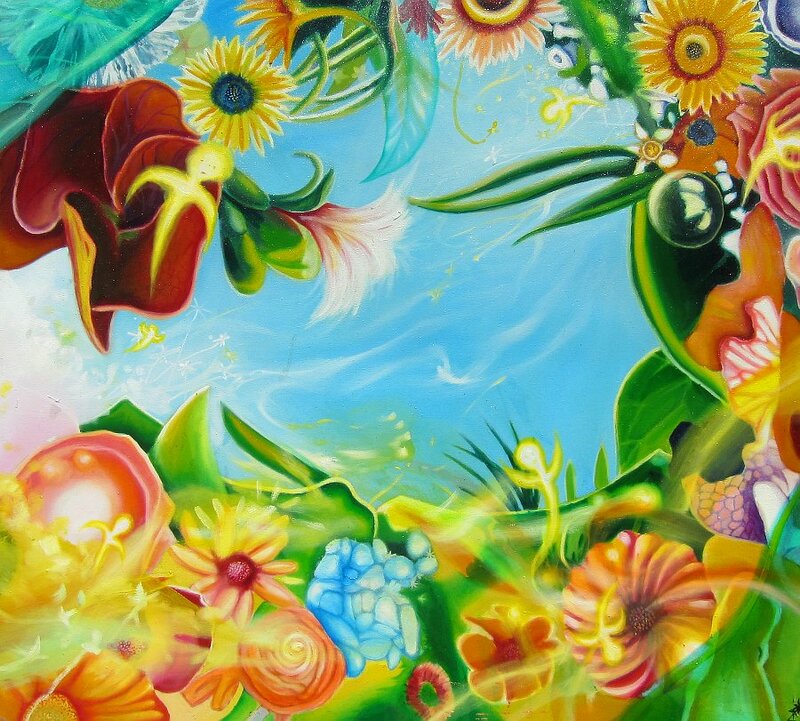 The painting shows how the surrounding light can feed and nourish not only the flowers themselves but the beauty they project. The tulips appear to be immersed by light, but at the same time appear to want to take off as if they are ready to fly on their own, because of the energy the light imparts to them. 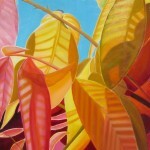 Glorious Leaves is another new painting where a powerful light dominates and enhances the features of the motifs. The leaves are backlit, with the light slightly to the left of them. 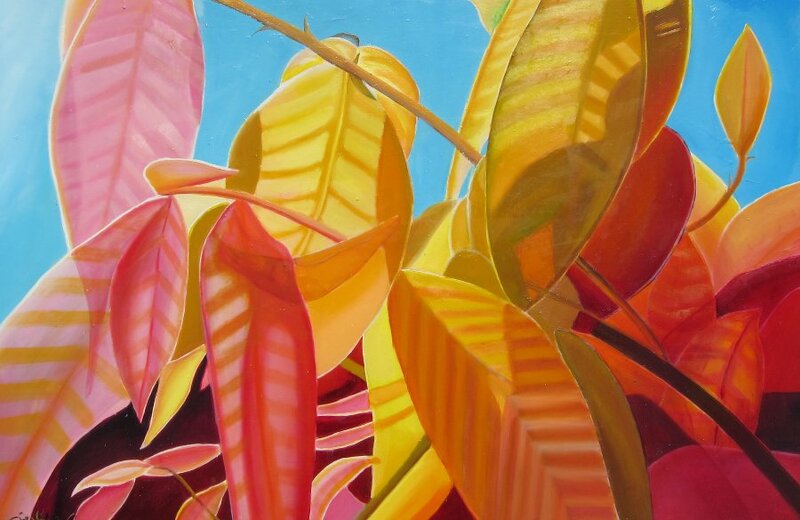 The play of light and shadows created by the layers of leaves, creates exciting patterns that add life to the painting and the leaves themselves. Depth is created by the dark corner (bottom right) and the highlights on the left side of the painting. These leaves seem to be like a community. Just the way they sit together suggests that they are in unison with one another and the light which permeates them gives them a strong and confident air. The third new painting is titled Garden with Angelets. This painting is about fun and life. 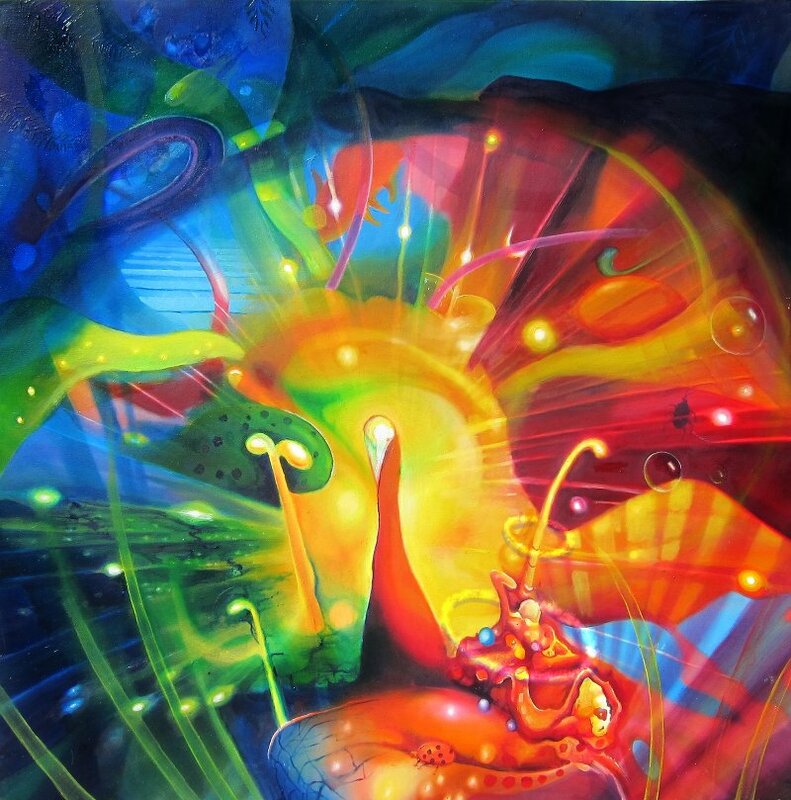 The inclusion of the Angelets helps add a fantasy element to the painting. The flowers seem to be frolicking and there are little sparkling lights everywhere. The movement and general atmosphere of this painting is light and breezy. This painting could cheer just about any room with its colour and its light. All three paintings have been added to the botanical paintings page of the site. This entry was posted in Uncategorized on March 31, 2016 by Lenny. There are only days till the Illuminate Exhibition and I am madly finishing off paintings by the dozen for it. It’s been a hot summer and the garage has not been forgiving. I’ve kept my energy up by drinking copious amounts of water and having short power naps in the heat of the afternoon. The Illuminate Exhibition will open on Thursday, 24th March at 6:00PM with a gala opening with music by Kulturithmik, drinks and refreshments. The outlay of the Professional Centre is varied with a long winding hall which traverses the centre from entry to the end. There are four open sections (the foyer, the conference room, the stairwell and another foyer at the back). These sections will display the largest paintings. The Illuminate exhibition will showcase a collection of works exploring the qualities, nature and ideas surrounding the concept of illumination. These works will explore all aspects of illumination like light and its many facets, properties, and characters – those things which light reveals and clarifies, including truth, wisdom, love, revelation – light in nature, in flowers, leaves, sky and the landscape – the light of the city- the light of life. I’m expecting a big night with lots of attendees and lots of fun, music and laughter. I’m currently finishing off most of the works with glazes and little touch ups. The sizes of the paintings will vary from very small to quite large. Some of the large paintings I expect will get some very positive responses. A few of these I think are quite spectacular. Not all of them will be as colourful as the signature paintings (the peacock ‘Illuminate’), but all of them will engage the viewer and I hope get them thinking about some of the important things in life. The exhibition will continue from the 24th March through to the 8th of April and will be open on Easter Saturday and Monday. The Professional Centre is open from 9:00AM to 5:00PM Mondays to Friday. This entry was posted in Uncategorized on March 19, 2016 by Lenny.